Provided photo The land prior to the Wastewater Treatment Plant improvement project. The headworks structure, oxidation ditches, final clarifiers, and secondary control building are all being built on abandoned quarry land that Piqua Materials Inc. donated to the city of Piqua. Provided photo The Wastewater Treatment Plant improvements as of March 2019. Provided photo The Wastewater Treatment Plant improvements as of March 2019. The oxidation ditches and the three final settling tanks are visible. 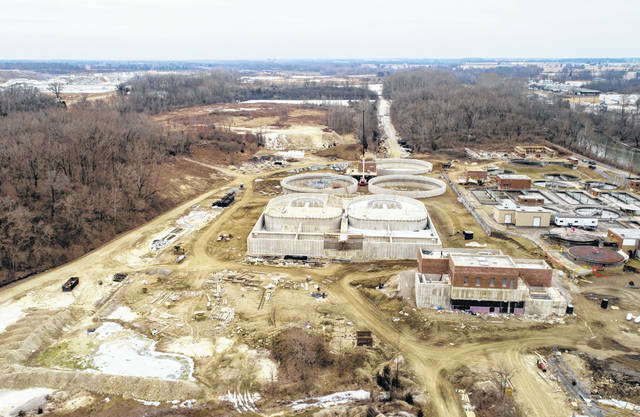 PIQUA — The city of Piqua Wastewater Treatment Plant is approximately halfway done with its $40 million improvement project and has seen the majority of the concrete poured — including 18,000 cubic yards of concrete and 1,600 tons of rebar — for new structures at the plant. “Right now, we’re halfway through,” Wastewater Treatment Plant Superintendent Chris Melvin said. While many of the structures are built, he explained that they are not necessarily functional yet. The city of Piqua first broke ground on the project in September 2017. The improvements include expanding the plant to get rid of the city’s sanitary sewer overflow (SSO), which is untreated wastewater that overflows into the Great Miami River. The Piqua City Commission awarded the construction contract to Peterson Construction Company for the expansion and upgrades of the plant. The cost of the project is not to exceed to $42,314,738, which includes a 5 percent contingency. The project is being funded through a loan from the Ohio EPA Department of Environmental Financial Assistance (DEFA). In addition to SSO, the improvement will also be able to address harmful algae blooms. The improvements also include increasing the plant’s capacity to treat wet-weather flow without sewer backups and treatment tank overflows and the addition of oxidation ditches for biological removal of organics from incoming wastewater. The headworks structure, oxidation ditches, final clarifiers, and secondary control building are all being built on abandoned quarry land that Piqua Materials Inc. donated to the city of Piqua. “We have the headworks structure erected with brick on the outside,” Melvin said. A number of the components for the headworks building are in place, including filter screens and a grit tray system. The headworks building will also include an electrical room, switchgear for the new 1500KW standalone generator, a control room, and a heated dumpster area. The oxidation ditches are also complete. The extended aeration oxidation ditches have a serpentine flow pattern and modulation zones for biological nutrient removal, including phosphorus and nitrogen that can contribute to harmful algae blooms. The oxidation ditches also qualified the city to be eligible for a zero percent interest loan for a portion of the project due to it removing biological nutrients. Melvin said that the first oxidation ditch been leak tested and passed. The electrical building has also been built and the electrical conduit it has been installed. The Piqua Power System moved the electrical supply lines, Melvin said. “Some of the main drain pipes are in place,” Melvin said. He said that they have installed over a mile of piping as part of the improvements. While many improvements have been made during the first year and a half, there is still more work to do. Still to come, the Wastewater Treatment Plant has 8 feet of back-fill dirt to put in place around a number of the new tanks. “We’re just now starting to interface into the existing plant,” Melvin said. A number of the existing buildings at the plant will be re-purposed. A notable component still to come for the project is that the plant’s existing chlorine contact tank will also be retrofitted with an ultraviolet (UV) disinfection system, which is expected to be an updated, safer, and more effective disinfection technology. The work is expected to begin in November. The aeration basins will also need to be converted to aerobic digesters. “There is an incredible amount of work still,” Melvin said. The project was mandated to eliminate the city’s SSO. The renovations will allow the plant to accommodate 8.7 million gallons of wastewater flow per day (MGD) and a new peak hourly flow of 22.5 MGD. Design flow is nearly twice that of existing and new peak flow is nearly triple the current peak flow, according to Melvin. Construction is scheduled to be complete in the summer of 2020.
https://www.dailycall.com/wp-content/uploads/sites/30/2019/03/web1_Bare-quarry-ground-before-construction.jpgProvided photo The land prior to the Wastewater Treatment Plant improvement project. The headworks structure, oxidation ditches, final clarifiers, and secondary control building are all being built on abandoned quarry land that Piqua Materials Inc. donated to the city of Piqua. 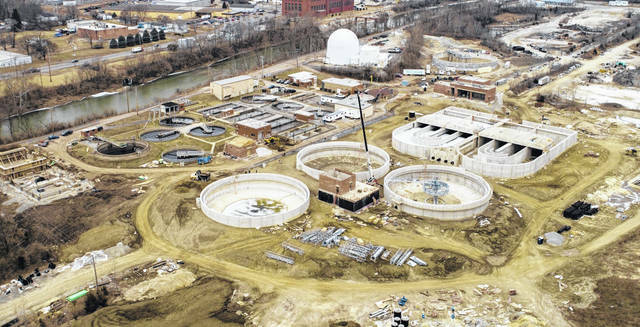 https://www.dailycall.com/wp-content/uploads/sites/30/2019/03/web1_WWTP-03-08-19-1-2.jpgProvided photo The Wastewater Treatment Plant improvements as of March 2019.
https://www.dailycall.com/wp-content/uploads/sites/30/2019/03/web1_wastewater-plant-drone-image-March-2019.jpgProvided photo The Wastewater Treatment Plant improvements as of March 2019. The oxidation ditches and the three final settling tanks are visible.